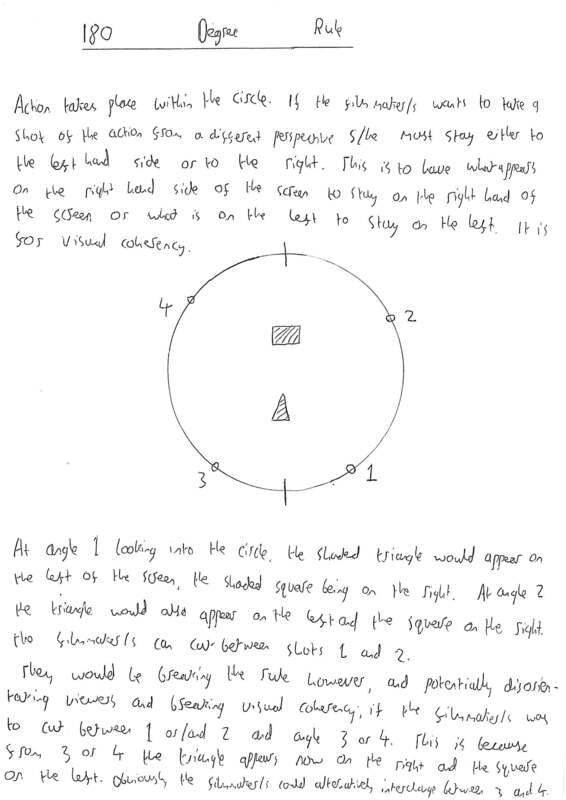 We were tasked with making a thirty second piece of footage to demonstrate our understand and command of two filming techniques and the adherence of a filming rule. It also allowed us to familiarise ourselves with operating cameras and using the school editing software: “First-Cut”. Firstly, we planned out our work on storyboards before beginning the task. 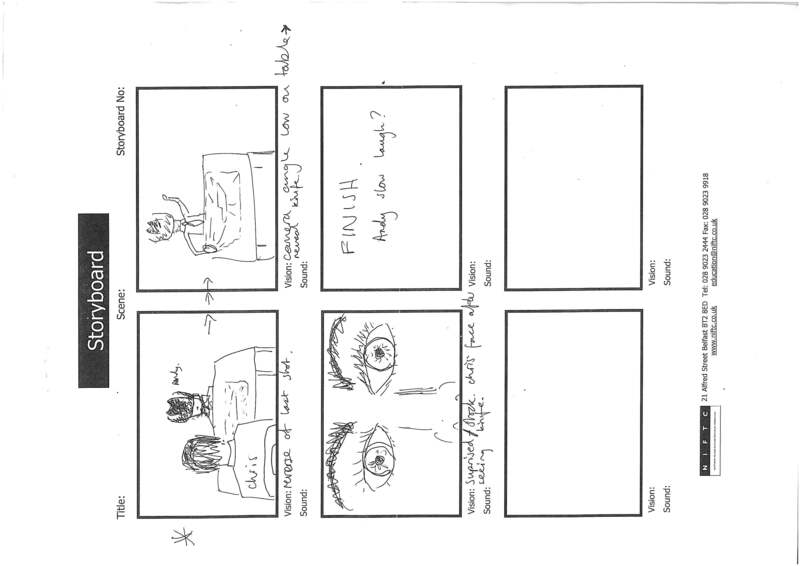 As you can see comparing the storyboard and the video, we deterred from the original plan in parts. The order of the Shot/Reverse Shots altered in the actual shooting. Also, my reaction to the knife was made more comedic for the viewer’s personal delectation. I found the camera simple to operate although the tripod stand was cumbrous and more difficult to set up than capturing the footage proved. Confessingly, my role in the editing was not as active as it could have been. I did make suggestions for alterations, and what I would have preferred to see and hear in the footage but I did not participate in the actual manual work of the editing. I oversaw the entire process and understood the rudiments of working the software but, if I were to work singly, I doubt I would surpass the titling of even the most inceptive of novice editors. I must ensure that I am proactive in using the editing software next time the oppurtunity arises. We had to keep the footage to within 30 seconds which we did although the video absently runs on for longer. Two shots which cut together. When they cut, they splice two different perspectives of an action in occurence (demonstrated at 2-3 seconds and 9 – 10 seconds). Most commonly used in a conversation situation, Shot/Reverse Shot is a cut of two angles facing each other showing two sides of action – like a conversation from one person’s perspective and then the other (demonstrated between 17-25 seconds). Unfortunately, we broke this rule at 22 seconds. Andrew with the hat, who spends the entirety of his footage on the right hand side of the screen, is suddenly thrown to the left hand side, and I am thrown to the right although I have been on the left throughout. This can potentially disorientate a less perceptive viewer. Retrospectively, we erred in the storyboard. 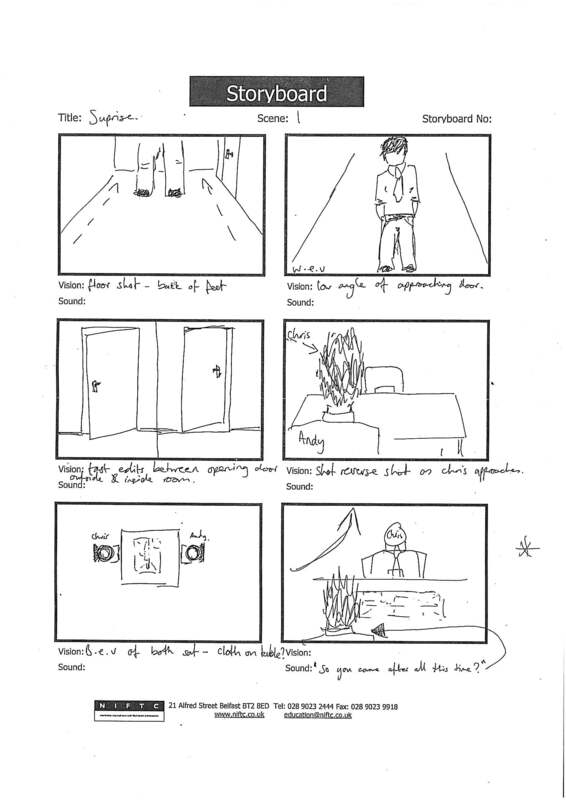 If one was to read the storyboard alone, the 180 Degree Rule is broken in the 5th box on the first sheet – I have moved to opposite sides of the screen. One may have found that mistake an easy one to make due to one character wearing an obvious hat and the other not; the characters were so manifestly differentiable in terms of appearance, the inadherence of the rule did not seem to disorientate the viewer. 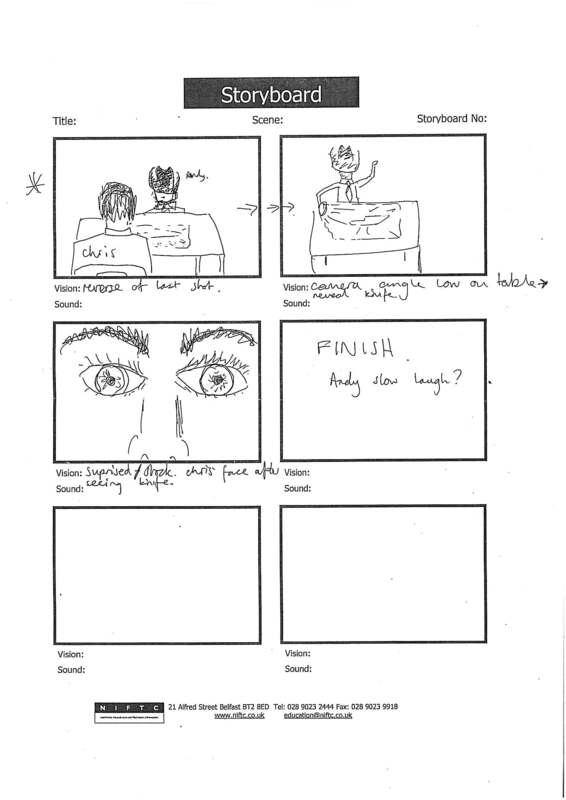 We can still learn a valuable lesson – to check through our storyboards more thoroughly, and look specifically for inadherence to the 180 Degree Rule before rectifying the issue. Here is the footage again but with the correction at 22 seconds. I now stay to the same side throughout with Andy on the opposite side. We managed to fix this problem not by filming again but by utilising an editing technique called flopping. Flopping is a rotation of the image until it has fully flipped. Whatever was on the left is moved to the right but the image still seems coherent to gravity, horizontal camera angling and so forth. Watch both films and one can note the flop at 22 seconds.